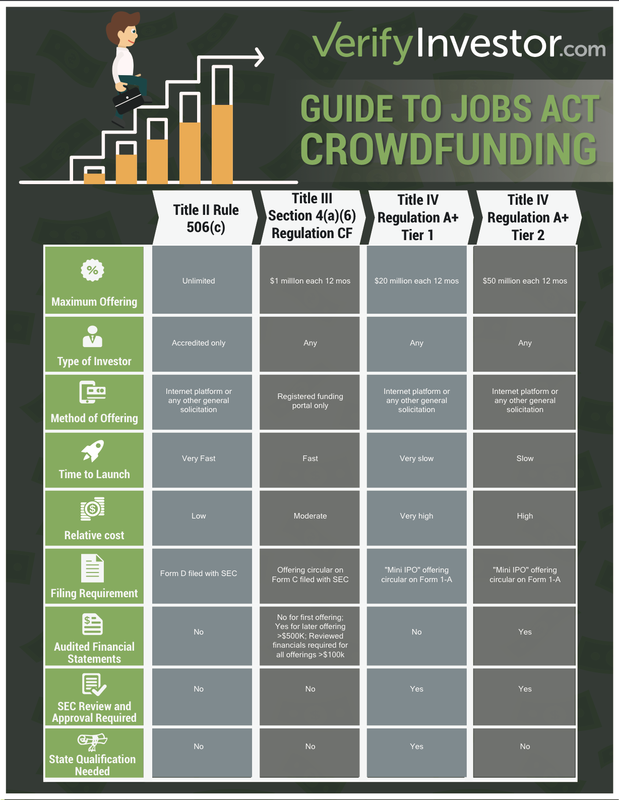 What Equity Crowdfunding Campaign Types Are Best for Startups and Small Companies – Title III or Title IV, Reg A+ ? Trying to Determine What Equity Crowdfunding Option is the Best Method of Fundraising to Fund Entrepreneurs and Startup Companies? How much money do you want to raise? And what step of the crowdfunding escalator does your company currently reside? Donation Crowdfunding – For ideas or concepts, entrepreneurs should consider Donation Crowdfunding and try to raise $10,000 or less with the goal of putting together a business plan, developing a website and begin working on prototypes or service beta programs. Rewards Crowdfunding – Once a prototype and/or beta test program has been developed and is ready to be tested for marketplace acceptance, startups should consider using Rewards/Perks Crowdfunding and set a goal of raising $25,000 to $100,000, but should have a crowdfunding PR and social media marketing campaign designed to raise up to $1 million or more based on marketplace demand. This crowdfunding step should be targeted to raise enough money to pay for the first manufacturing production run or minimum viable product (MVP) and provide a sufficient marketing budget to continue selling the produce/service and gaining marketplace traction once the crowdfunding campaign concludes. Equity Crowdfunding – Depending on the marketplace success, the final step is using equity crowdfunding to raise sufficient capital to launch a business on a regional, national or international level. Similar to an Initial Public Offering, the company can offer investors convertible notes, debt, revenue sharing or equity shares via a Title II (Rule 506 and Rule 144A offering), Title III offering or Title IV offering, which each has its own set of rules briefly outlined in the chart above. Title III is capped at $1 million every 12 months, Title IV is capped at $50 million every 12 months and Title II can raise unlimited funding with no time limit. Crowdfunding Escalator – This entire process is called a crowdfunding escalator by many in the crowdfunding industry, which is a step-by-step process that allows a creative ideas to work their way into becoming successful and thriving businesses via larger and larger crowdfunding campaigns as a company grows, matures and gains marketplace traction. Do you want to target 8.7 million sophisticated accredited investors or open the offering up to 188 million non-accredited, novice investors throughout the U.S. (and Canada)? Accredited Investors – Only about 3% of the accredited investors are active investors in the United States because until 2013 it was illegal to use general solicitation to reach this target audience and most deals were channel through registered broker dealers. The key is to know how to reach these angel investors and venture capitalists with advertising, email marketing, publicity and targeted social media marketing. Non-Accredited Investors – The other 97% of the population falls into the novice investor category that is literally an untapped target audience because it has been illegal to market fundraising campaigns to this segment of the population since 1934. Title III and Title IV crowdfunding are designed to educate this new class of investors, teach them how to vet deals and allow them to make the same type of early stage investment usually reserved for venture capitalists by carefully researching the Form C disclosure documents for Title III and Form 1-A disclosure documents for Title IV, Reg. A+ offerings. And now that marketing offerings to this audience is legal, success is only limited by a company’s marketing budget. 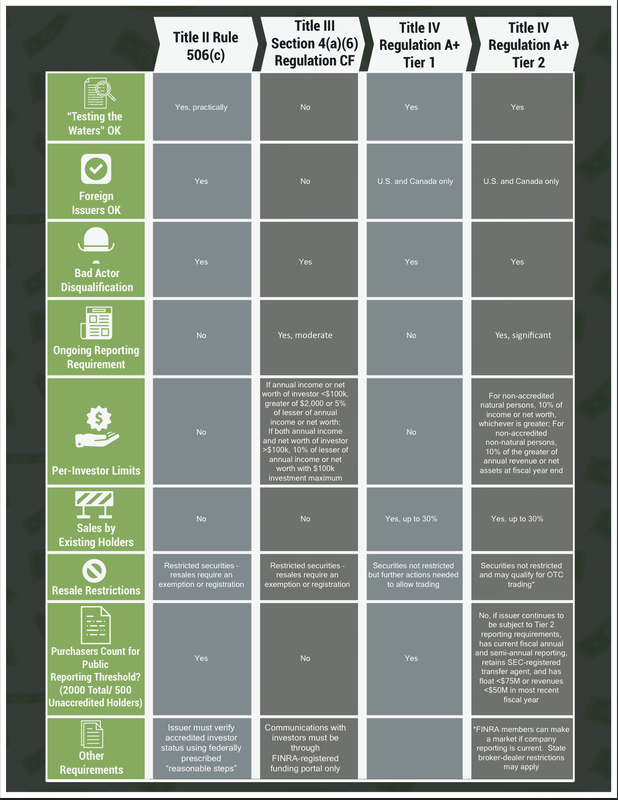 Do you want to utilize a registered Title III crowdfunding portal or regular website combined with general solicitation (advertising/PR/social media)? Title III/Advertising Offering Terms is Prohibited – In contrast to Rule 506(c) offerings, which permits general solicitation if certain conditions are satisfied, an eligible issuer or persons acting on its behalf cannot advertise, directly or indirectly, the terms of a crowdfunding offering. However, an issuer can publish notices (for example, in newspapers or on social media sites or the issuer’s website) that direct investors to the intermediary’s platform and contain only limited factual information about the offering and the issuer. Despite this advertising prohibition, an issuer (or persons acting on its behalf) may communicate with investors about the offering terms through communication channels provided on the intermediary’s platform if the issuer identifies itself (or persons acting on its behalf identify their affiliation with the issuer) in all such communications. Title IV Utilizing General Solicitation – Title IV offerings are allowed to use any website/portal combined with advertising, email marketing, PR and social media to market the terms of their offerings in order to attract new investors, which means investors throughout the entire United States and Canada. Mr. Hoskins consults on a regular basis with crowdfunding campaign managers as well as crowdfunding sites, portals and platforms to deliver successful crowdfunding marketing campaigns.